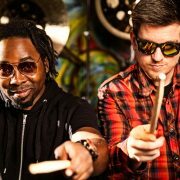 Ghost-Note will be performing two sets @ SOMF’19! Ghost-Note’s first record, Fortified, which debuted at #1 on the ITunes Jazz charts in 2015, not only showcases Searight and Werth’s unique duo approach to rhythm, but it also highlights a phenomenal community of Dallas musicians. Fortified includes features by Shaun Martin, N’Dambi, Mark Lettieri, Caleb McCampbell, Jason “JT” Thomas, RSVP, and Nick Werth, and guest appearances by Cleon Edwards, Taron Lockett, Marcelo Woloski, Wes Stephenson, Bob Lanzetti, A.J. Brown, and Sylvester Onyejiaka. In addition to touring across the United States, the band is also working on their second album to be released in fall 2017.